If you took a poll asking people whether they’d prefer to be responsible or irresponsible travelers, most would likely choose the former over the latter. 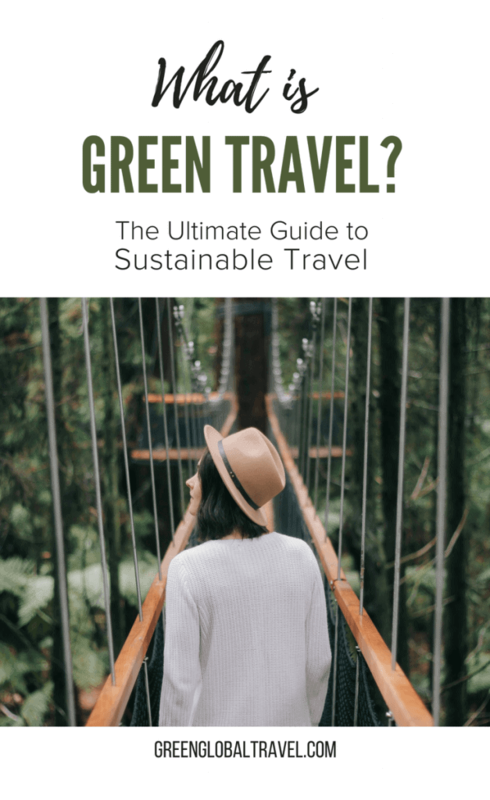 But what does “Green Travel” even mean? How do you do it? Do you have to sleep in a tent and cook on a solar-powered camp stove in order to be considered eco-friendly? And how do you recognize it when a company that offers “Green Travel” experiences is, in fact, just greenwashing? The truth is that sustainable travel (a.k.a. ecotourism) is all about making simple choices in order to lessen your negative impact on a given destination. Individually, each one of these choices makes only a small difference in the big picture. But collectively, becoming more conscious about these little things can have a huge cumulative impact. 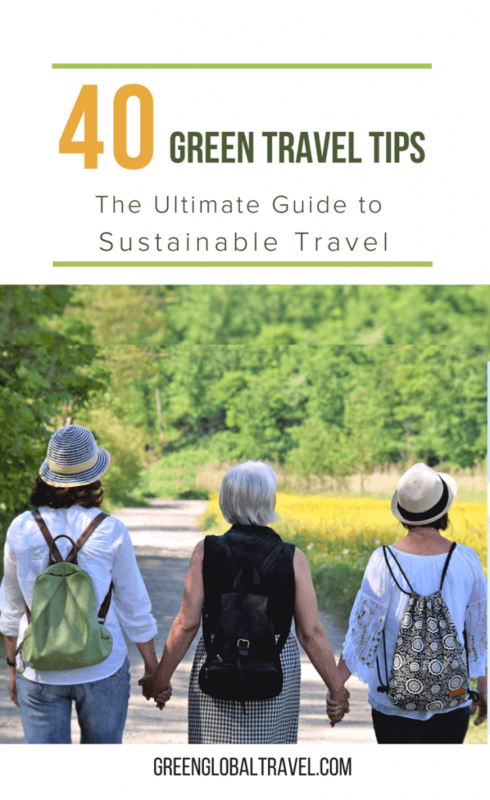 So here’s an in-depth look at what Green Travel is, why it matters, and an extensive array of easy tips designed to help you travel more responsibly and sustainably. 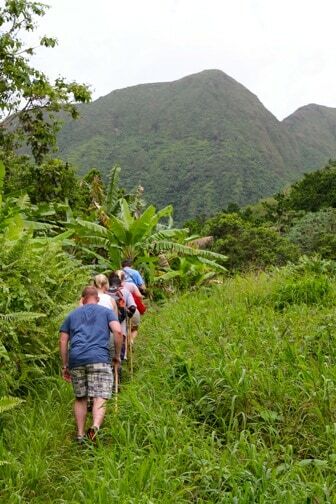 When we started Green Global Travel back in 2010, the field of ecotourism was largely unknown to average travelers. It had not yet become the buzzword it is today, and was primarily a term used by insiders in the fields of responsible travel and conservation. But green energy– renewable energy harnessed from sustainable natural sources such as sun, wind, tides, and geothermal heat– was gaining steam as a movement thanks to thought leaders such as Al Gore. Green living– the lifestyle that aspires to conserve and protect the Earth’s natural resources, habitats, and biodiversity– was beginning to grow in popularity. 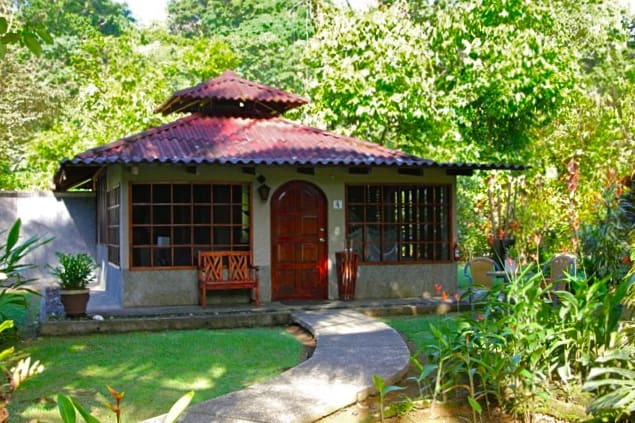 “Green” became synonymous with “eco-friendly” or “environmentally conscious.” So green travel came into vogue as a broad term used to encompass ecotourism and responsible travel practices, which generally strive to benefit the environment and the social and economic well-being of the local people. 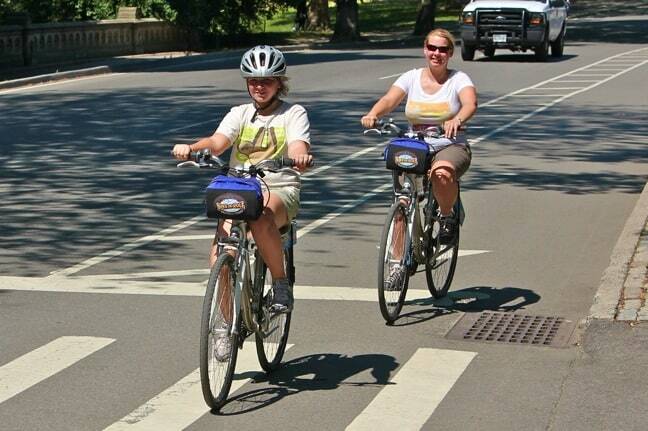 When done well, green travel is the antithesis of mass tourism. It’s all about trying to make smarter choices that help to mitigate the negative impacts we create when we travel. We cannot control the carbon emissions of the planes we fly in, the chemicals used by the hotels in which we stay, or the plastics used in the souvenirs sold in the destinations we visit. But we can choose more eco-friendly transportation, hotels, tour operators, and shopping tactics that do less damage to the environment, and create more benefits for local people. According to a recent TripAdvisor survey, nearly two-thirds of all travelers are increasingly inclined to make more environmentally sound choices and travel green. The problem is, how do we tell the difference between green travel and greenwashing? A play on the term “whitewashing,” greenwashing is defined as “disinformation disseminated by an organization so as to present an environmentally responsible public image.” In other words, greenwashing is about using marketing strategies in an effort to deceive customers into believing that a company’s products, activities, or policies are genuinely eco-friendly when they really aren’t. As the green movement gradually began to enter the mainstream, countless companies proved willing to greenwash if it brought them the green they wanted most: Money. Adjectives such as “all natural,” “organic,” and “post-consumer recycled content” were rendered meaningless, as claims were rarely substantiated or verified by impartial third parties. The travel industry was no different. Tour operators who promoted themselves as being eco-friendly still offered irresponsible activities such as walking with lions tours, elephant rides, and visits to Thailand’s Tiger Temple. So how are travelers to know whether a company is truly green, or just greenwashing? • Truly responsible travel businesses will put the needs of the local people and environment before the needs of travelers, always striving to make a positive impact. 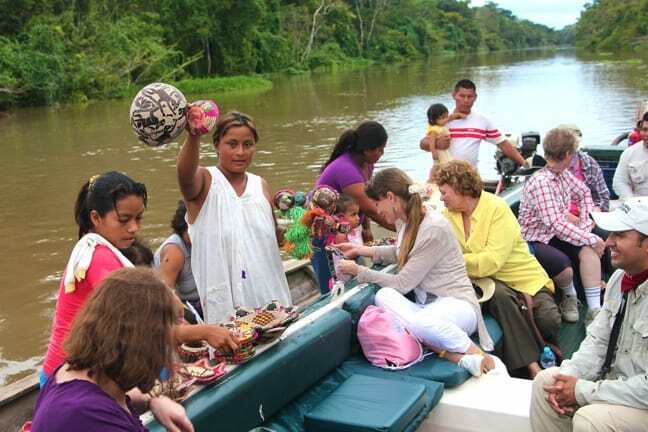 • If there is a voluntourism element involved, truly responsible travel businesses will work directly with local NGOs to ensure the program meets the needs of the community and are not just “feel good” experiences for travelers. Again, the primary goal should be long-term positive impact. • Truly responsible travel businesses may be affiliated with international organizations such as World Wildlife Fund, the Nature Conservancy, Rainforest Alliance, etc. 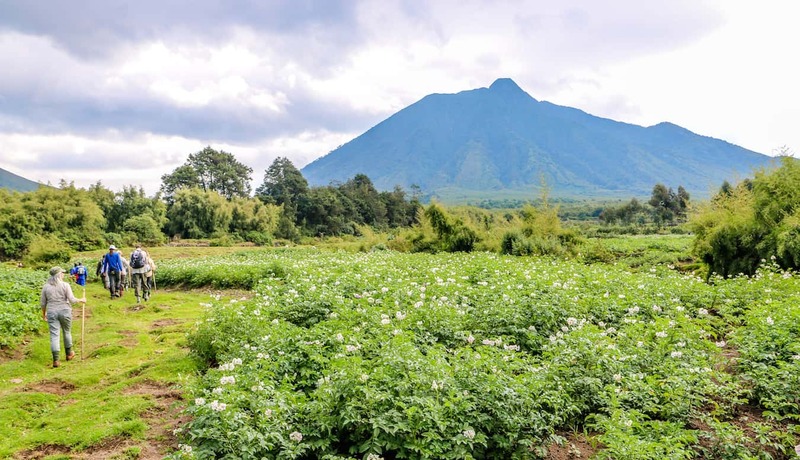 They may also have certification from organizations such as the Global Sustainable Tourism Council or the Center for Responsible Travel, which prove that they have met certain recognized standards for sustainability. • Truly responsible travel businesses pride themselves on openness and transparency. Most will have details on their sustainability and corporate social responsibility initiatives clearly placed on their website. And any “green” company should be more than happy to answer any questions you may have about these initiatives. What we’ve assembled below are 40 tips that EVERY traveler can use to make their adventures more friendly to the environment and the people and animals who inhabit it. Most of them are ridiculously simple, such as using a refillable water bottle, putting a “Do Not Disturb” sign on your hotel room door, and buying locally made products rather than imports. But if every one of our 90,000+ unique monthly visitors gradually began incorporating these Green Travel tips into their trips, our collective impact could be amazing! 1. Try to book non-stop flights whenever you can: It’s the takeoffs and landings that create most of an airplane’s carbon emissions. 2. If you’re traveling with family or friends and the destination is within driving distance, perhaps you should consider taking a road trip. But if you’re traveling by yourself, it’s actually much more eco-friendly to fly! 3. If you do fly, consider doing so with one of the 30+ IATA (International Air Transport Association) member airlines who offer carbon offset programs to neutralize the aircraft’s carbon emissions by investing in carbon reduction projects. 4. If you decide to drive to your destination and your car isn’t eco-friendly, consider renting a hybrid or electric vehicle, which use less fuel and produce less carbon emissions than gas-guzzlers. 5. If you have the time, traveling via bus, train, or ship generally has less negative environmental impact than traveling by plane. 6. When traveling in the U.S., check to see if the hotel has LEED Certification from the U.S. Green Building Council. The program judges hotels on sustainable site development, water savings, energy efficiency, material selection, indoor environmental quality, and innovation in design. 7. When traveling overseas, look for seals of approval from other certification programs, such as EarthCheck (Australia), Green Globe, Rainforest Alliance (Latin America, Caribbean), and Green Tourism Business Scheme (UK). Some countries, including Costa Rica, have their own certification programs to rate sustainability initiatives. 8. 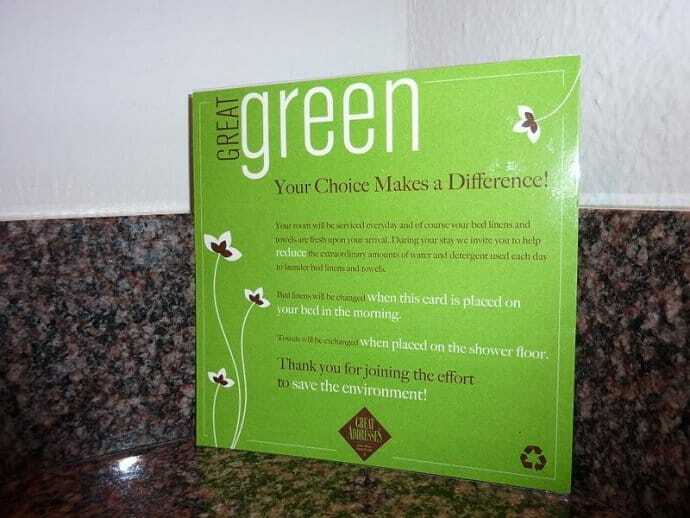 Ask if the hotel has a recycling program. If not, encourage them to start one when you leave suggestions on comments cards at check-out. 9. Ask questions about the hotel’s sustainability initiatives, such as solar power, wind turbines, rainwater harvesting, energy-efficient lighting, and low-flow toilets. 10. Find out what percentage of the hotel’s resources are local. Do they hire mostly local staff? Do they get most of their foods locally, or even grow them on the property? Do they use locally sourced materials in the décor? Companies that utilize indigenous resources tend to be more sustainable, as they’re investing in the local economy. 11. Take a BPA-free water bottle you can refill over and over again. Many international airports have free water dispensers, which saves you money and wasting plastic bottles. 12. Take showers, not baths. Showers use just 10-25 gallons of water, while baths use up to 70 gallons. Feeling frisky? Shower with a friend and save even more water! 13. Try to take shorter showers, turning the water off while you lather up, shampoo, shave, and/or brush your teeth. 14. Never use the hotel laundry, as they typically wash every guest’s clothes separately (even when there are only a few items). We usually wash our clothes as we shower, then hang them up overnight so they’re dry the next day. 15. Hang up your towels after each use, which is the universal sign that you’d like to use them again. You don’t wash your towels every day at home, so why do it when you travel? 16. When you leave your room, always turn off all lights, heat/AC, and television. Closing the curtains and blinds can help keep out the heat of the sun in summer. 17. Leave the “Do Not Disturb” sign on the door of your room for the duration of your stay. This cuts down on chemical cleansing agents, electricity used in vacuuming, and the washing of bed linens. 18. Walk, bike, or use public transportation to get around whenever possible, which cuts down on gas usage and saves you money. 19. Return maps, brochures, and other tourist info once you’re finished with them so that they may be reused by future travelers. 20. Take any leftover soap, shampoo, or toothpaste with you. Unused portions are often thrown away, and you can reuse the plastic bottles in the future. 21. Marked hiking trails are there for a reason. Stick to the path to avoid harming native flora and avoid any creepy-crawlies that may be lurking in the underbrush. 22. Bring along a small bag and pick up any trash you spot along your hike. Have a friendly competition to see who can clean up the most unsightly waste! 23. Never feed or touch wildlife, for any reason. Feeding animals makes them habituated to and reliant on humans, and often leads to attacks. If you get bit, the animal will most likely be killed. 24. Research weather conditions and terrain before you go hiking. You don’t want to be that guy (or girl) who got lost and required a ranger rescue, which drains public resources. 25. Keep a respectful distance from wildlife. Yes, we understand that you want to Instagram your encounter with a grizzly bear. But if you’re close enough to attract an animal’s attention, you’re too damn close! 26. 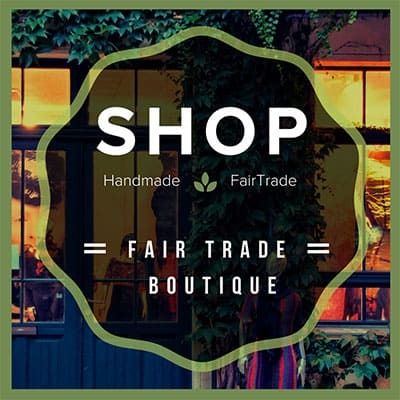 Buy locally made (preferably handmade) products, rather than those that have been imported. Items that are flown or shipped in have a much larger carbon footprint, and who wants a cheap, cookie-cutter souvenir made on an Asian assembly line? 27. Don’t buy anything made from endangered plants/animals, unsustainable hardwoods, or ancient artifacts. Not only is it wrong, but you probably won’t be able to get them back through customs. 30. Do not buy souvenir photos from anyone exploiting wildlife, such as the famous performing elephants of Thailand. 31. 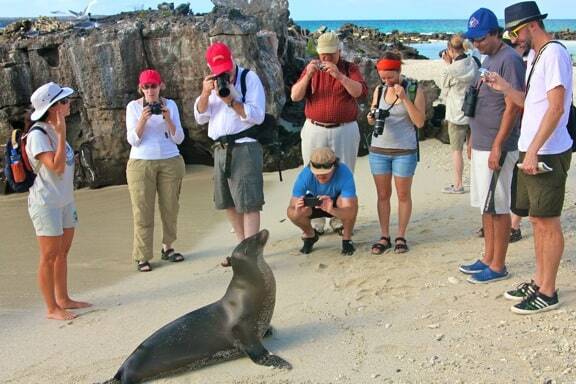 Travel with small group tour operators, which tend to have less of an environmental impact. 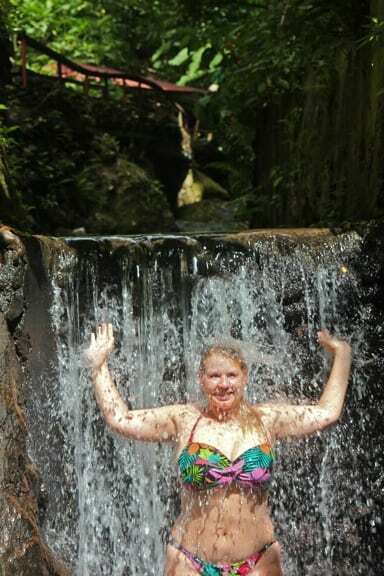 Membership in an organization like The International Ecotourism Society is a good sign that the tour operator tries to conduct itself in a responsible, sustainable manner. 32. When snorkeling or Scuba diving, don’t touch/step on the coral or stir up sediment, as it can damage the reef’s fragile ecosystem. 33. Ask your snorkel or scuba diving tour operators if they chum the water to attract marine life. Doing so can change the behavior of marine species, or possibly make them sick. 34. 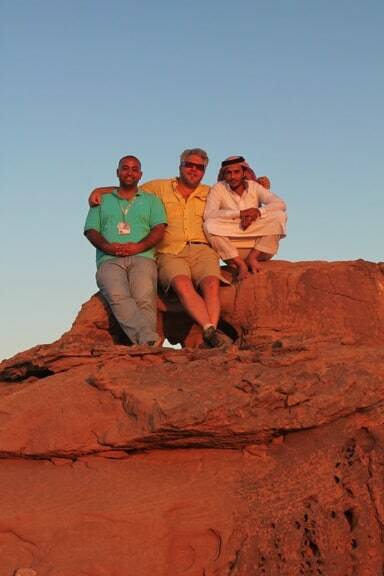 Find out how the tour operator gives back to the local community. Do they lease the land from locals? Do they hire local guides? Do they take a leading role in preserving the area’s natural resources? 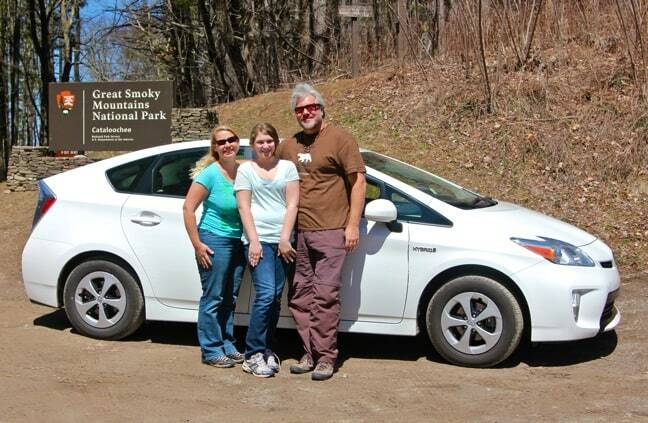 Community-based tourism is the most sustainable. 35. Don’t take any tour that promises hands-on encounters with wild animals, such as riding elephants or walking with lions. If you do, you’re supporting an industry that illegally captures, transports, and abuses millions of animals each year. 36. Honor local customs. Do a little research before you travel to learn about the destination’s local cultural traditions, so that you can speak and behave appropriately. 37. Ask for permission before taking a photo of someone. In some cultures, taking a person’s picture is like stealing their soul. and in general it’s just common courtesy. 38. Learn the language, or at least a few important words. You don’t have to do a full Rosetta Stone course. But you’d be amazed by how knowing simple phrases such as “Thank you,” “My name is,” and “Please help me” will impact the way locals will treat you. 39. Give back. Whether you sign up for a full-on voluntourism vacation or work with a non-profit like Pack For A Purpose to provide much-needed supplies to local schools, it doesn’t take a lot of extra effort to make a huge difference in the local community when you travel.